Moscow, December 26, Interfax – The Imperial Orthodox Palestine Society has called on United Nations Secretary-General Ban Ki-moon to put an end to the lawlessness perpetrated by rebels in Syria. “The brutal attack by rebels on the ancient Convent of St. Thecla in Maalula and the cynical abduction of the mother superior and nuns of this ancient convent, where forty orphaned girls lives, is a challenge to the whole global community and an insult to all civilized norms,” the Imperial Orthodox Palestine Society said in its letter to Ban Ki-moon and UN High Commissioner for Human Rights Navi Pillay, a copy of which was obtained by Interfax-Religion on Thursday, says. Among these crimes is the abduction of Syrian hierarchs such as Metropolitan Paul of Aleppo and Metropolitan Gregory Ibrahim, whose fate remains unknown. 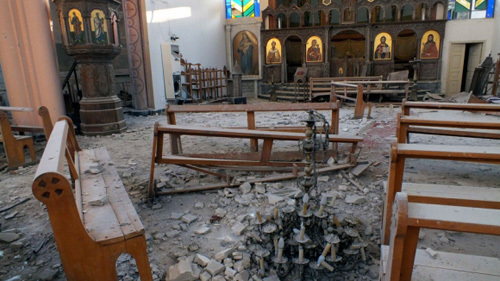 The letter says that over sixty ancient churches have been destroyed by rebels and Christians are being subjected to especially cruel violence. The Imperial Orthodox Palestine Society, which has consultative status in the UN, called on the UN to intervene in the situation and do everything to prevent a real and large-scale threat and the destruction of religious balance in the Middle East, which could have catastrophic consequences for the entire Middle East. The Imperial Orthodox Palestine Society called on the UN to develop a global mechanism for preventing violations of the fundamental rights of people of various religions, discrimination, and religious persecution. The letter was signed by Imperial Orthodox Palestine Society Chairman Sergey Stepashin, Yelena Agapova, the head of the Russian Public Center of the Imperial Orthodox Palestine Society for the Protection of Christians in the Middle East and Northern Africa, and Natalya Narochnitskaya, president of the European Institute of Democracy and Cooperation.